Frogs, like salamanders, newts and toads, are amphibians. Most amphibians begin their life cycles as water-dwelling animals, complete with gills for breathing underwater. As they grow to adulthood, amphibians normally become land-dwelling creatures, lose their gills and develop lungs for breathing. Frogs are no exception to this process and are able to breathe through their lungs once they reach adulthood. Frogs still in the larval stage, called tadpoles, are very different in outward appearance and internal physiology from their adult counterparts. Most notable is the presence of gills instead of lungs during this stage. Tadpoles can also take in oxygen through their skin, a trait that aids in gas exchange (bringing in oxygen and expelling carbon dioxide, as with lung respiration) while the tadpole is living completely underwater. As a frog matures from tadpole to adult, it loses its gills and develops functioning lungs. During this transition, and after maturity, frogs are still able to breathe through their skin. This trait is known as “bimodal breathing,” in which an animal uses two different systems for bringing in oxygen. These two different breathing systems allow adult frogs to shift between aquatic habitats (which require skin respiration) and land habitats (which are more suited to lung respiration) with ease. An adult frog’s thin and permeable skin allows it to take in oxygen, even when completely submerged. Oxygen readily passes through this thin membrane-like skin, providing the frog with the oxygen it needs to stay alive under water without the need for gills. Because of the permeability of a frog’s skin, moisture is lost easily and most frogs must remain in a moist or humid environment in order to retain their water levels. 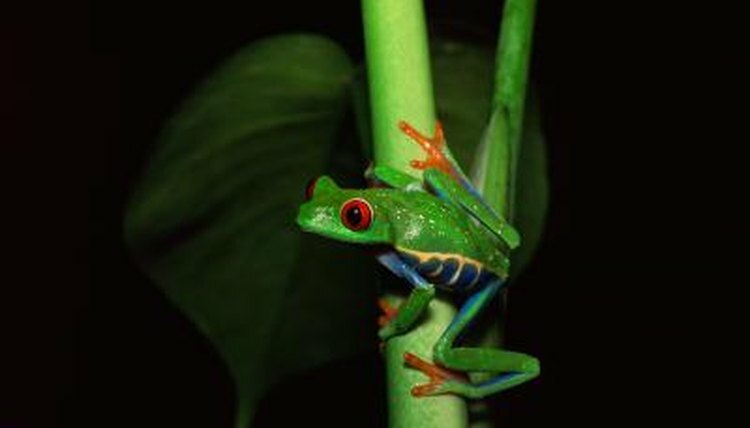 Compared with many other amphibians, frogs have relatively well-developed and complex lungs, which are subdivided and contain many alveoli—tiny sacs that are responsible for gas exchange within the lungs. Unlike mammals that control their breathing with the diaphragm, frogs use their mouths and nostrils in tandem to bring air into their lungs. When a frog breathes in, it lowers the floor of its mouth and relaxes its throat. Then it opens its nostrils to allow air to enter into the newly expanded mouth and throat, at which point the frog contracts its mouth floor and forces air into the lungs. Canadian Wildlife Federation: Why Do Frogs Breathe Through Their Skin if They Have Nostrils and a Mouth?